Dogs are loyal companions that quickly become part of the family. But dogs also require some maintenance, from regular pet visits to grooming and more. It’s important to care for them properly, and it’s not always as straightforward as you may think. Dog’s ears are a great example. So what should you know in order to better attend to their needs? A dog’s ears are shaped like an “L.” While the human ear canal is a straight shot to the eardrum, a dog’s ears take a sharp, 45-degree turn inside the ear canal. This makes it easier for dirt, debris and even bacteria and yeast to get trapped before it reaches the eardrum. To avoid irritants building up in your dog’s ears, your grooming regimen should include regular ear checks. If your dog’s inner ears look dirty, clean them with a cotton ball dampened with mineral oil, hydrogen peroxide or a solution formulated specifically for this purpose. Inner-ear skin is delicate, so allow your vet to show you the proper technique before you try it yourself. Make sure to clean gently and not overzealously, as excessive cleaning could also cause irritation. 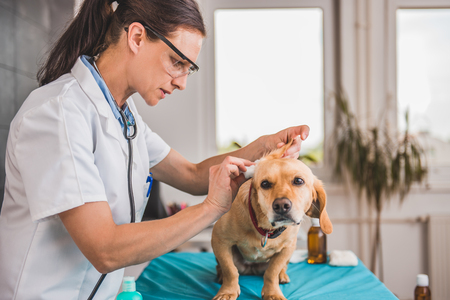 If hair is growing from your dog’s ear canals, consider having a groomer tweeze it to prevent mats and tangles from forming, but check with your vet first. Signs that your dog has an ear infection are not always obvious, so it’s important to know what to watch out for. If your dog is dealing with an ear issue, he may obsessively lick at a paw, shake his or her whole body, become irritated or stop coming when called. Other symptoms include scratching at the ears, whining, shaking his or her head, smell and discharge. When you’re looking for a dog, it’s important to work with a breeder that can provide you with plenty of options and tell you more about how to care for your new pet. At Pauley’s Pups in Ashland, Virginia, we have lots of toy and small breed dogs for sale, and we can help you pick out the best one for your lifestyle. Contact us today!